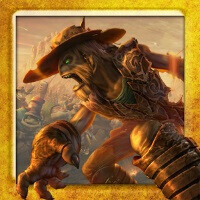 Oddworld: Stranger's Wrath, an Xbox title re-imagined for smartphones and tablets, is out now on Android and iOS. Being on the bleeding edge of the graphics' end, this game requires at least a 1.2 GHz dual core CPU, 1 GB RAM with Adreno 220, Nvidia Tegra 3, ARM Mali 400-MP, PowerVR SGX 543MP, or similar GPUs. In other words, you need a decent mid-range Android, at the very least, to run it comfortably. Apple users don't have much of a choice beyond the iPhone 5, iPhone 6, iPhone 6 Plus, and the last two iPads. So what do you get for $6 besides sweet graphics? Stranger's Wrath offers 20 hours of gameplay set in the dusty, undeveloped wastelands of Western Mudos. You'll play as Stranger, a drifter turned bounty hunter whose business is hunting outlaws. And business is good, because the re-imagined game comes with fully configurable touch-screen controls, a scalable virtual joystick, seamless transition between first-person and third-person point of view, strategic action gameplay, tons of dialogue and an original soundtrack, bosses with outlandish arsenals and outrageous names, and more. In addition to third-party controller support, the game has leaderbords, achievements, and cloud save functionality. It sounds like some quality work went into it! Check out the screenshots and trailer, and download the game from the links below. I thought on Android it would be a timed exclusive to Amazon (and its Kindle). That was one of the shortest timed exclusive I know lol. And phonearena mentioned the Sony nexus. What's your point hewhohasnoclue? They can be interchangeable at times, clueless one. Is this the first reason to actually buy a flagship phone? What else pushes the limits of a mobile device these days? The new NFS game would. Pity it's only a limited release so far. Can't wait to try it out in English. And I'm sure that it comes in at a hefty file size as well. Found it in Google Play for my Note 3 and it says File Size: 1.11GB. If it can run on a duel core 1.2 ghz with 1 gig of ram I don't see how this game can push the limits of something much more powerful with 3 times the ram?? This looks fantastic. Can't wait to play on my Note 4 tonight! Just don't expect it to run it on maximum settings. Judging by the developer notion, maxing this on 1440p is too much even for the Adreno 420. Honestly I wasn't expecting to. I just look forward to having fun with this. Yeah, I'm already having fun with it :) It definitely is a great game, just have some patience while getting used to controls. Runs okay maxed on my Note 3. And honestly, you don't have to up the resolution all the way in the Note 4 since you are most likely not to notice the difference between 1080p and 1440p, and Adreno 420 should run it great on 1080p ( slide to about three fourths of the resolution setting in the game). I've been playing since yesterday. It's pretty good so far. I have it maxed except for resolution as well. I can't complain though. It's fun. The game is awesome but you're better off playing this on PC or PS3. Do you play it with a controller? If so wich one? And does it have full functionality?